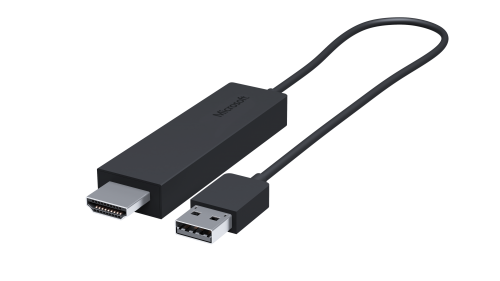 Today Microsoft announcing the Microsoft Wireless Display Adapter, which connects to an HDTV, monitor, or projector and will let you easily share content from any Miracast-enabled device﻿ – including many PCs and Tablets running Windows 8.1. With the Wireless Display Adaptor, I don’t have to worry about getting everyone to huddle around a device. All the content I care about, along with audio, is easily shared on the big screen. The adapter should reach North America in October for $60 (America Only for now). CES 2013 - The GWAVR -- a little black box which plugs into your display via HDMI, It's intended to receive 1080p video and 5.1-channel audio from mobile devices and computers, via WiDi,Miracast or DLNA from up to 30 ft away. A button on the side of the "dongle" switches between those three standards, and it's as simple as that.